Let's face it.... all dog breeds harbor flees. It's as natural as shedding hair. The likelihood of your dog getting parasites such as fleas and ticks is very likely and if your dog is itchy it is a sure sign you are in need of a flea spray. But with so many treatments and sprays currently in the market it is hard to know which is the best treatment for your dog to not only control them but also prevent them. We hope to shed some light and find ways to combat these pesky parasites. Why do Some Animals have Fleas? Unfortunately even the most groomed dogs are prone to being affected by fleas including stay at home pets. Ideally prevention is often the best method than cure to treat ﻿inf﻿estation and its effects. The truth is that as a dog owner you will have to take on all year round preventative action against fleas. If your dog is infested with fleas they are swarming everywhere- between their toes, underneath the collar, burrowed inside their ears and even passed onto your home furniture and carpets. If left untreated it can become a nightmare to get rid of. Using a flea comb through your dog’s coat will remove some fleas, make sure though you kill them with your finger against the comb. Other effective treatments that you should consider are: tablets, flea collars like the Seresto flea collar or spot-on products placed at the back of the neck of your dog. Truth is, once spring comes you have to be prepared to face those pesky critters. Alternatively, you can spray using a flea spray, wash them using a flea shampoo or even powder your dog. If you have more than one pet then treat them all at the same time as your dog. Bear in mind you may also need to treat your furniture and carpets as fleas can easily transfer and infest these so use separate products to eliminate them from your home. Soon enough you will end up with enough arsenal against fleas and ticks your dog will love you and start enjoying life again. Control Fleas using a Flea Spray - How Does It Work? If there is any hope against those pesky parasites a good flea spray will eradicate them safely and efficiently. A flea spray can be used both on your pet and your home, think mattress, carpets, sofas and even in the inside of your car. It works by releasing neurotoxins directly onto the fleas and on impact it paralyzes them preventing them from biting their hosts. The reason is so effective is that those chemicals the spray releases stops fleas and ticks from forming and thus laying their eggs – i.e. putting a dead-end to their life cycle. The sprays’ chemical compound metamorphoses at room temperature which allows it to spread evenly and deeply in some of toughest carpets. Their chemical structure is also safe and has a low toxicity to most mammals. House studies done on flea sprays that contain the common chemicals of Tetramethrin, Permethrin and Methoprene have been shown to be a safe and effective way to control flea development for 12 months. Whether you choose an aerosol or pump flea spray both are effective in the removal of infestation of fleas in both your pet and your home. Spray it liberally on your pet and anywhere in your home that harbors fleas – upholstery crevasses in sofas and chairs, cushions, curtains etc. Let it dry and give your home a good hoovering once sprayed and dried. Designed to work on impact, this product delivers unlike other sprays where a few days treatment Is required. Simply ruffle their coat and spray directly on your pet and use a soft cloth to spread the product evenly when applying to their face, around the mouth, nose and eyes and get relief for your pet quickly. The spray is designed to kill fleas at all stages life – Eggs, Larvae, Young and Adult effectively breaking their life cycle for up to 2 months. It’s safely used on both dogs and cats so if you have other pets, treat them all at the same time. Recommended usage for dogs and puppies from 10 weeks + old and cats and kittens from 12 + weeks old. The only downside to the product is its strong medicinal smell which can be unpleasant to some people. 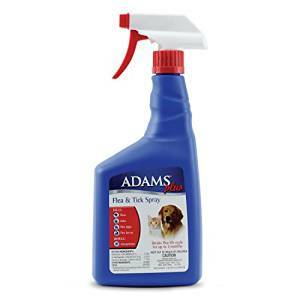 A quick solution is to spray your pet outdoors but overall this product which contains three active ingredients delivers on its promise at eliminating fleas. The instructions are clear and easy to follow for example using between 1-2 spray pumps per pound of body weight and is safe to use on pups from 8 weeks old although a customer reviewed using Frontline Flea Spray effectively on a 2 day old pup! The spray also acts as a preventative for paralysis ticks for 3 weeks. Slight disadvantage is that it does have a strong chemical smell and is a little pricey. The product is designed also to use on pets and not also in your home. What comes across from the customer’s reviews is that this flea spray works not only on your dog (or cat) but is also in your home. And let’s be honest it is pointless to treat your dog and also not your home. 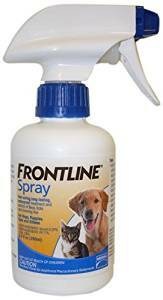 If your dog is particularly sensitive this spray is safe to use and can also be used freely around young children. It has pleasant smells of peppermint oil and clove extracts (its main ingredients) which can be quite long-lasting for a few days after application. So if you don’t like to use chemicals, then this product is for you. Use the spray as indicated with this all natural, non-toxic product that eliminates fleas, flea eggs, ticks and pretty much every other parasite as well on contact!